Devin Hart of Point Pleasant Boro, one of the nation's top recruits, has narrowed down his college choices. 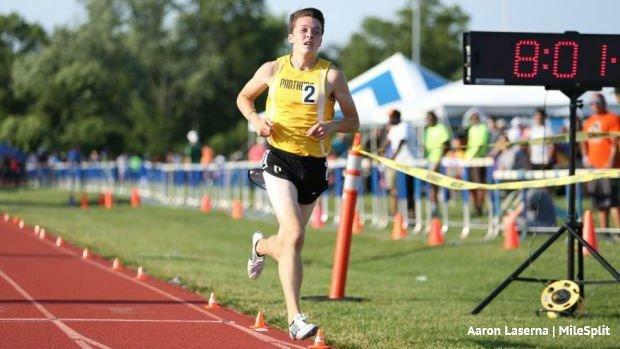 The All-American distance runner took a visit to Duke last month, and he said that he will take only two more official visits-one to Stanford University and the other to Princeton University. Hart will be heading to Stanford the first weekend of October, so he will miss the Shore Coaches Invitational at Holmdel Park on Oct. 6. He is scheduled to visit Princeton the second weekend of October. Whichever school lands Hart will be getting a stud! Hart, who will open his XC season at the Bowdoin Park Classic on Sept. 22, has built a remarkable resume during his career. Hart has won four NJSIAA Meet of Champions titles (two in the 3200m outdoors, one indoors in the 3200m and one in XC), has thrown down some of the state's fastest times ever at multiple distances, and is coming off a junior outdoor season that was one of the greatest in state history. The biggest highlight of Hart's 2018 outdoor campaign came last June when he completed one of the most amazing true distance doubles in state history. At 8 p.m. (Eastern Time) on June 8, Hart ran 8:53.56 for two miles, No. 6 in state history, to place fourth at the Brooks PR Invite in Seattle, Washington. Then at 5 p.m. (Eastern time) the next day, he dropped an 8:58.58, No. 8 in meet history, to win his second straight 3200m title at the NJ M of C. Two sub 9's in 21 hours!!!! That's just plain crazy! Hart's outdoor junior season also included a victory in the 3K at the Penn Relays, a third-place finish in the 5K at the New Balance Nationals in 14:44.06, and a 1600m PR of 4:09.49. Hart, 10th at the Foot Locker XC Nationals last year, has some huge goals for his final high school XC season. He wants to win Foot Locker Nationals, repeat as M of C winner, and set some course records along the way. One of the records that Hart has his eye on is the Ocean County Park course record of 14:43 set in 2013 by Mike McClemens of Christian Brothers. Hart ran 14:51, No. 3 all-time at OCP, when he won the Ocean County title last year. Hart, who owns a Holmdel Park PR of 15:34, is also seeking to become just the sixth boy in state history to crack 15:20 at Holmdel. The five runners who have gone sub 15:20 at Holmdel are all legends of the sport-Edward Cheserek of St. Benedict's Prep (14:53 in 2011), Joe Rosa of West Windsor North (14:55.6 in 2009), Jim Rosa of West Windsor North (15:14.7 in 2010), Craig Forys of Colts Neck (15:15.2 in 2006), and Jason DiJoseph of Paul VI 15:16.2 in 1988). Will Hart add his name to that list of all-time greats? I wouldn't bet against him!